By 1880, four years after Alex Mentry brought in California's first commercially successful oil well deep in Pico Canyon, the unskilled labor of the indigenous vaqueros was insufficient for the task at hand. Mentry started importing experienced drillers from Pennsylvania, some of whom had families. Entertainment was sparse. Unhitched oil workers frequented the numerous saloons of Newhall  particularly the aptly-named Derrick Saloon on Railroad Avenue , as Mentryville was a "dry" town. The first family activities took place in the one-room Felton School, which was erected in 1885 on the north side of Pico Road in the heart of Mentryville. Dances were held on Saturday nights, but the dances drew such large crowds that before long, a separate structure was needed. The dance hall was built next door to the school, just a few dozen feet to the west, probably in the late 1880s. According to local historian A.B. Perkins, Chester Johnson led a trio or quartet, and the ladies would provide refreshments. 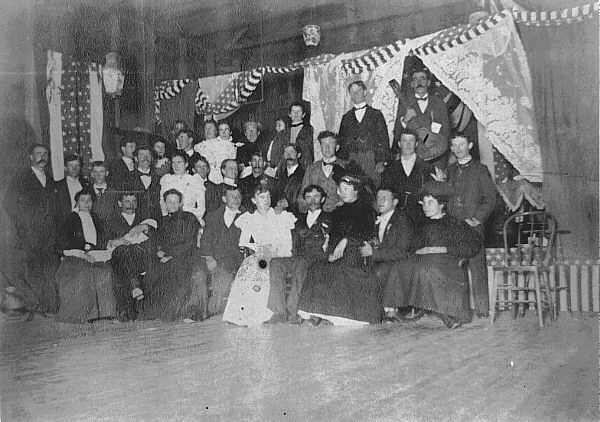 The dance hall was welcomed as a change of pace by the residents of Newhall, as evidenced by this c. 1890s photograph, which shows many well-known citizens of both Mentryville and Newhall. FIRST ROW, SEATED, LEFT TO RIGHT: Edith Embody, Dan Pardee, Julia Pardee, Ted Tychsen, Mildred Embody, Henry Swall, Leslie Pardee, Ollie Lingwood, Estella Swall. SECOND ROW, STANDING, LEFT TO RIGHT: Will Garrigan, Albert Swall (Newhall merchant, later hotelier), Frank Kinear, Chester Gulley, Laura Garrigan, Theo Owen, Mabel Gifford, Charlie Hover (sp? ), Dr. McLeod, Ed Mathers, Ed Ryan, Rob Miller. THIRD ROW, LEFT TO RIGHT: Will Miller, Irene Mentry, Louis ?, Kelly Young, Gertrude Kinear, Mrs. Miller, Bertha Scott, Florence Powell, Guy Owen, Bud Hunsacker. The Mentryville dance hall no longer stands. For more information read The Story of Mentryville by Leon Worden.